While a further rally in risk assets and a compression in credit spreads will require a follow-through by the Fed as a well as cooling of trade tensions, the Fed has done its part to quell market volatility to start off 2019. One sector that has had a particularly strong rebound is Energy. In his December press conference, Federal Reserve Chairman Jerome Powell dismissed market concerns over further interest rate hikes, roiling an already troubled equity market. The result was one of the worst months for risk assets in recent memory – the S&P 500 suffered the worst December since the Great Depression. Credit markets also experienced a massive negative turn in sentiment and price performance. Investment grade credit spreads closed the year at 153 basis points, nearly 50 basis points higher than the closing level on September 30. Just a few weeks later, on January 4, Powell spoke on a panel with former Fed Chairs Janet Yellen and Ben Bernanke at the American Economic Association conference. His remarks reflected an about-face from his December press conference. Notably, Powell stressed flexibility in Fed policy: “We’re always prepared to shift the stance of policy and to shift it significantly if necessary;” and, we’re: “Listening sensitively to the message that markets are sending;” and on the potential to pause its rate hike as well as balance sheet runoff, he said: “We will be prepared to adjust policy quickly and flexibly and to use all of our tools to support the economy.” The Fed then bolstered its messaging around a hiking pause this week when speeches from Fed officials Charles Evans, Loretta Meester, and Eric Rosengren echoed a similar tone. Financial stability and markets are now squarely and explicitly in the Fed’s crosshairs, and a dour market mood turned around on a dime. Credit markets have snapped back. 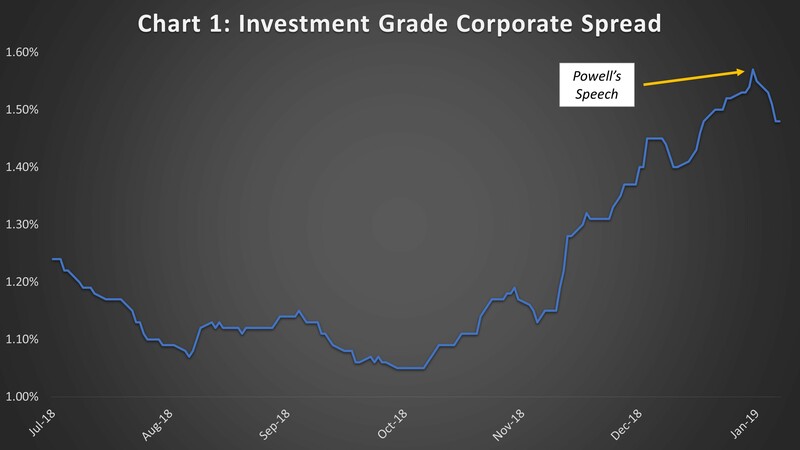 Investment grade corporate spreads, which peaked on January 3, the day before Powell’s speech, have compressed by 9 basis points (Chart 1). More notably, high-yield credit spreads have fallen by 92 basis points, which retraces most of December’s move (Chart 2)! The Energy sector has seen a particularly strong rebound in both spreads and sentiment, bolstered by a rebound in the benchmark West Texas Intermediate Crude Oil price from a low of $42.53 on December 24, 2018 to $52.02 on January 11, 2019. 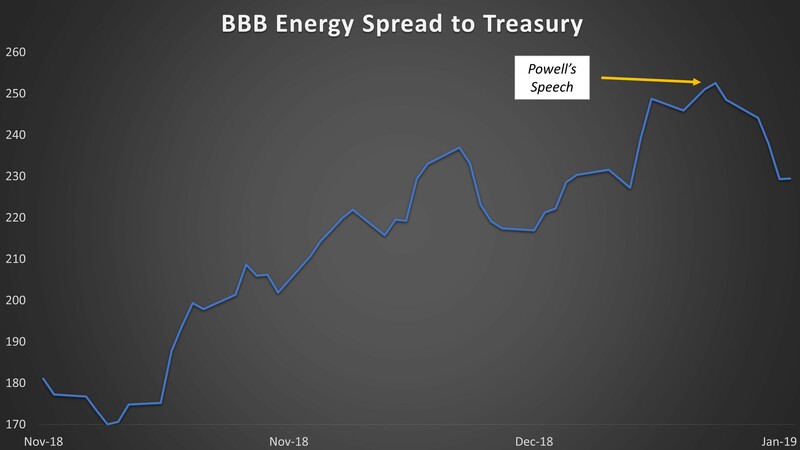 Energy sector BBB spreads compressed nearly 20 basis points following Powell’s comments, but perhaps the most notable development was the reopening of the high-yield new issue market by natural gas pipeline operator Targa Resources (NYSE: TRGP). Targa priced the first high-yield bond issuance this year, the first since December 11, 2018. 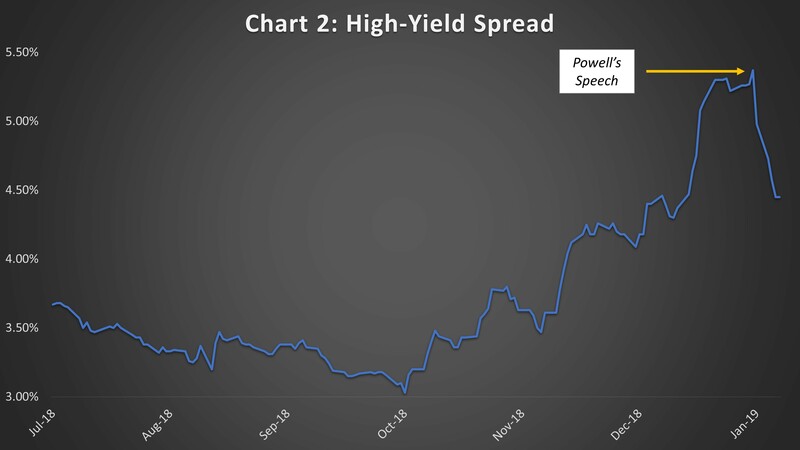 Prior to this deal, the high-yield new issue market had been effectively closed for a month due to extremely poor sentiment surrounding risk assets. It’s significant that the volatile Energy sector was the home of the first company to break the drought. So strong was the demand for this speculative new issue that Targa was able to garner $1.5 billion in bond proceeds, twice the planned initial amount. The new bonds have performed well thus far, trading 2 points higher and nearly 40 basis points tighter in spread since issuance. It’s significant that the volatile Energy sector was the home of the first company to break the drought. The fact that an energy company had a successful issuance speaks volumes of where sentiment is headed. It also confirms the idea that expectations for global demand growth are perhaps turning more positive.